SERVICES - Ruffin' It Pet Resort, Inc. Packages are available for those wanting to come and play more often! See staff member for details! At Ruffin' It Pet Resort our day care program is designed to give your dog a safe and fun environment. 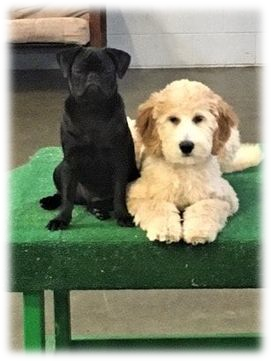 Constant supervision is provided by trained staff who love dogs and understand their behavior.​ Day care is an excellent way for dogs to get the exercise and socialization that they crave. We cater to dogs of all sizes and activity levels. We have a "no bullying" policy and ensure that play is appropriate so that all guests have fun. Day care is great for dogs that have separation anxiety or become bored and misbehave when alone. Our guests go home happy and tired! 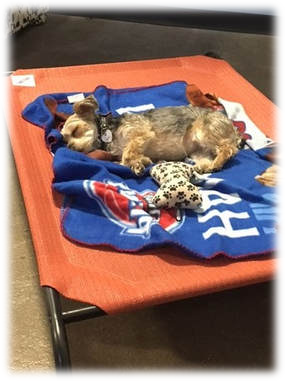 At Ruffin' It Pet Resort dogs play, run, nap, and relax in a designated area. They have access to the outdoor area when the weather permits. Play structures, toys, and pools keep them busy. Couches and cots for naptime. Meal service with your food is available at no extra charge. A pre-evaluation ensures our guests are in an appropriate play group for their size and energy level. Discounts are available for longer stays! See staff member for details! Ruffin' It Pet Resort offers overnight boarding services for both dogs and cats. Dogs enjoy all the benefits of day care during the day… such as being outside, enjoying fresh air, playing with friends, lots of love and attention. At night, our guests enjoy a private suite with a raised cot. Family suites are available for siblings. Providing them with your personal items such as their favorite food, treats, toys, and bedding plus our love helps alleviate homesickness. We welcome our other favorite four legged pets....Cats! Cats may seem quite independent, but we know they also love to be pampered! Our feline guests have a special area set up just for them in a dog-free zone, for a safe and truly relaxing personal environment. Climbing towers, toys, sleep areas, and litter box make them feel right at home. *Transportation is available when pre-arranged and is within a 3 mile radius from the resort. ​or email us at info@ruffinitpr.com. We Would Love to Have You Visit Ruffin' It Pet Resort Soon! Check out our Facebook page as well as follow us on Instagram to see events, photos and more!